From the days of Epsom Spa until 1847, a weatherboarded Watch House stood by the pond in Epsom High Street. The traveller Celia Fiennes praised its clock in 1711, although even by this date the building was thought to be old-fashioned. Like its counterpart in Ewell, the watch house was divided by a partition into a fire engine house and a temporary lock-up. The village constable was paid by the parish vestry for escorting prisoners to trial at the nearest town after they had been locked up overnight. In 1847 the vestry resolved to pull down the Watch House and sell its materials, including the clock and the old fire engine. William Andrews, whose father (the caretaker of the old building) had died the year before, sat on the rebuilding committee and had hoped for the architect's contract. In response to the advertisement for a clock tower - not more than 40 feet high, costing less that £350 - plans and estimates had to be prepared in nine days. To Andrews' chagrin, however, the winning design was submitted by two London architects, James Butler and Henry Hodge. 'The extreme height of the building is 70 feet', reported The Builder magazine, 'and the openings for the dials are 4 feet 6 inches. It is to be built of red and Suffolk bricks, the external faces rubbed and finished freely. The four lions, bearing shields, are to be of Caen stone'. On 19th November 1847 the foundation stone was laid by Thomas Tompson. He was chairman of the rebuilding committee, a linendraper in private life (his shop is now Waterstones). After the ceremony, his committee retired to a sumptuous dinner at the nearby Kings Head, while hundreds of enthusiastic locals celebrated with beer in the streets. The heraldic lions had disappeared from the corners of the tower by 1902, and were replaced first by electric lanterns, and then in the late 1920s by globe lights. At the same time the toilets were constructed east and west of the present building. The new fire engine was still kept at the base of the tower; in 1869 it was arranged that the bell at the top (a new addition, from the foundry of G.E. Mears) should be rung by a hammer as a fire alarm. In the 1870s Epsom received a fire escape from the Royal Society for the protection of Life from Fire, and for about thirty years this was left leaning against the tower, always at the ready. All public events in Epsom involved the Clock Tower, along with processions, a bonfire, patriotism, endless supplies of bunting and a large committee of local worthies. Particularly successful were the Diamond Jubilee of 1897, the Coronation of 1902 (when an ox was roasted at the foot of the tower), the Silver Jubilee of 1935, and the Coronation of 1937. 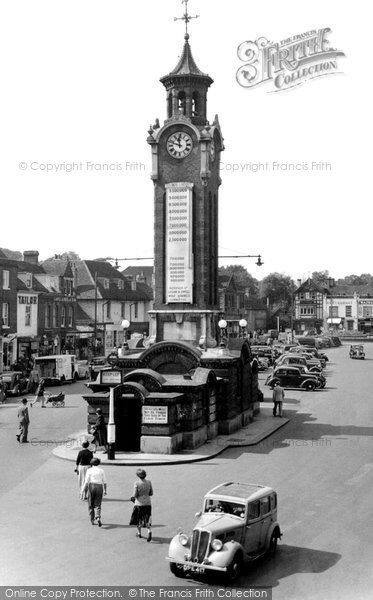 In September 1937 the Clock Tower had its proudest hour when the charter declaring that Epsom and Ewell formed a Borough was handed over at its foot.